﻿Dollar Bin Horror is hosting a challenge that involves watching 30 horror movies in 30 days. Cody is participating in the challenge, and will be posting his progress here in five chapters, an entry for every six days. A whole lot of elements aligned perfectly on this film, beginning with Wes Craven's genius idea, inspired by real news articles of kids who were afraid they'd die if they went to sleep (and apparently did), to take a vengeful spirit and make its haunting grounds not a physical location but the dreams of small town teenagers, innocent kids paying for the actions of their vigilante parents. It's a very scary and relatable idea - everyone has to sleep, everyone has nightmares, now your nightmares can kill you. The first twenty minutes of this film are fantastic. It doesn't start off with a kill like most horror films, but shows us the crafting of the killer's razor-clawed glove and a glimpse into the nightmare world. Babies crying on the soundtrack, sheep randomly scurrying across hallways, a young girl in a white nightgown walking through a filthy, damp boiler room before being attacked and quickly waking up to find slashes in her clothes. This effectively creates an air of dread that hangs over the film as we follow the girl through the next day, being introduced to the characters we'll follow. Night falls, there's another nightmare and when we finally get to the first kill, it's one of the greatest death scenes ever filmed. Another of the perfect elements is the casting of Robert Englund as this dream stalker Freddy Krueger, creating a character who, even though a sleazy child killer, quickly became an almost heroic pop cultural icon. In the first film, Freddy is portrayed in a much darker, scarier way than he was in most of the sequels, the makeup is even more gross, messier, but the character's sick sense of humor is still very apparent. The rest of the cast is excellently filled out as well, led by Heather Langenkamp giving one of the best heroine performances in horror. Well-filmed, the movie is topped off with a memorable, extremely creepy score by Charles Bernstein. 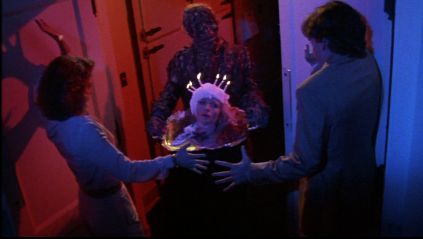 Stephen King and George Romero teamed up to make this homage to the old EC horror comics, packing five stories of zombies, revenge, monsters, and even roaches, into Creepshow's two hours: Father's Day, which contains some very quotable lines and some amazing dance moves from Ed Harris. The Lonesome Death of Jordy Verrill starring Stephen King, giving a hilarious performance as the dimwitted title character, who catches a bad case of space moss from the substance excreted from a meteor that lands in his yard. Something to Tide You Over stars Leslie Nielsen in a villain role as a jealous man who torments Ted Danson and Dawn of the Dead's Gaylen Ross. The Crate, with Hal Needham, Adrienne Barbeau, and Fluffy the monster, may be the most popular of the stories, and at almost thirty-seven minutes is also the longest of the bunch. E.G. Marshall carries the final story, They're Creeping Up On You, as a scumbag variation on Howard Hughes, a germophobe locked in the sterile penthouse of a high rise building, destroying lives over the phone as he fears he's dealing with an infestation of cockroaches. All of these stories are contained in a comic book that hardass father Tom Atkins has taken away from his son (played by King's son Joe Hill, who's now a successful author himself) and thrown into the garbage in the film's wraparound segments. As with all of the disagreeable characters in this film, Atkins has to deal with payback for his actions. Stephen King perfectly captures the tone of the EC comics with his stories and Romero directs them in a very stylized way. With the framing, colorful lighting, and occasionally even optical effects used to show the action in comic panels, Romero delivers a more accurate cinematic representation of the look and feel of comic books than most superhero movies. A sequel followed five years later and, as previously featured here, I'm a big fan of Creepshow 2 as well. Credited with being one of the films that started the big exploitation boom, H.G. Lewis's Two Thousand Maniacs was one of the earliest gore films, along with Blood Feast, which Lewis made the year before. celebrating is to kill a bunch of Yankees. One-by-one the tourists are lured away from each other by the townspeople and killed in inventive and, especially for the time, gory ways. It's a really fun, entertaining movie, my favorite of the H.G. Lewis splatter flicks. And if Jay Burleson ever wondered why I often exclaim "Hot doggy!" in reply to good news, it's because of Two Thousand Maniacs. A Hazmat team is looking to get a job clearing the abestos out of an abandoned mental hospital. Despite his right hand man's insistence that it will take three weeks minimum, the team boss agrees to get the job done in one week. As the week goes on, it becomes clear that something is wrong here. Stories of the lobotomies performed by the hospital in its heyday and an awesome monologue about a patient's repressed memories of Satanic ritual abuse give the film a disturbing feel, while the explanation of what inhaling abestos can do to your lungs makes even the sight of dust particles in the air frightening. While looking around the old offices, one of the team members finds a collection of tapes, interviews with a female patient who had multiple personalities, wherein a doctor is trying to find out details of the tragic event that got her committed. The team member takes breaks to listen to the tapes, which are numbered, and since we know the title of the film, we know something's going to go down when he reaches Session 9. It's a creepy slow burn of a film, well-written by director Brad Anderson and actor Stephen Gevedon. Anderson's direction and the editing is very effective in creating an unsettling atmosphere and the actors playing the Hazmat team - Peter Mullan, David Caruso, Josh Lucas, Brendon Sexton III, and Gevedon as the tape-listening team member - all put in great performances. It also has to be noted that David Caruso drops one of the greatest "F-bombs" ever in this film. 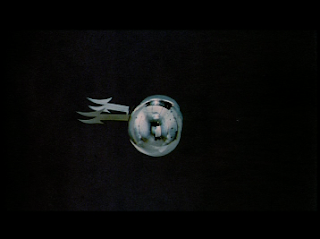 The sci-fi aspect in play is the fact that the funeral director, known only as The Tall Man, is actually an alien from another world or dimension, gathering corpses on Earth to revive them and shrink them into the dwarf creatures, sending them to his homeland through portals that are similar to large tuning forks. Once there, the corpses-turned-dwarves are used as slaves for unknown purposes. It's a strange story to try to describe and I'm not doing it much justice. Three sequels followed, and the world of Phantasm is still just as mysterious as it was in the beginning, if not more so. Writer/director Don Coscarelli made a very original, creepy film, that has a weird feeling hanging over it the entire time, aided by one of the best horror scores there is. Angus Scrimm became a horror icon with his portrayal of The Tall Man, and a fan favorite character is ice cream man Reggie, played by Reggie Bannister. Reggie's kind of a side character in the first film, but in the sequels he became one of the coolest heroes in horror. translating the book, and when the tape is played of him reciting an incantation, evil spirits awaken in the woods and attack. Possession, dismemberment and violation by living tree branches ensue. Ash is pretty much totally incompetent in this film, getting tossed around and pinned under busted furniture during the action in two different sequences, leaving the heroics up to his friend Scotty. It isn't until Scotty makes a real douche move and Ash is left alone that he finally steps up and takes care of business, losing his mind in the process. of the actors and crew go back home midway through production, leaving just a handful of people to complete the film, who completely focus on this movie every day for almost a year and kind of go as crazy as Ash does in this film and the sequel. But before I knew about the making of the film, before Ash became my hero, I already loved this film. 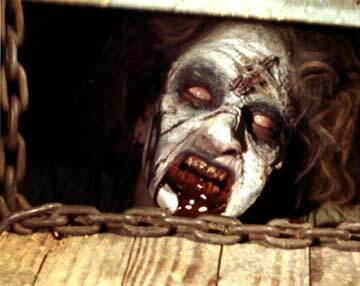 I first saw it when I was nine years old, when I was already a veteran horror fan who was never bothered by movies, and when I sat down to watch The Evil Dead by myself one dark night, it scared the hell out of me. That first viewing is the scariest movie watching experience I've ever had, and the film became an instant favorite... but it took me quite a while to work up the guts to watch it a second time.